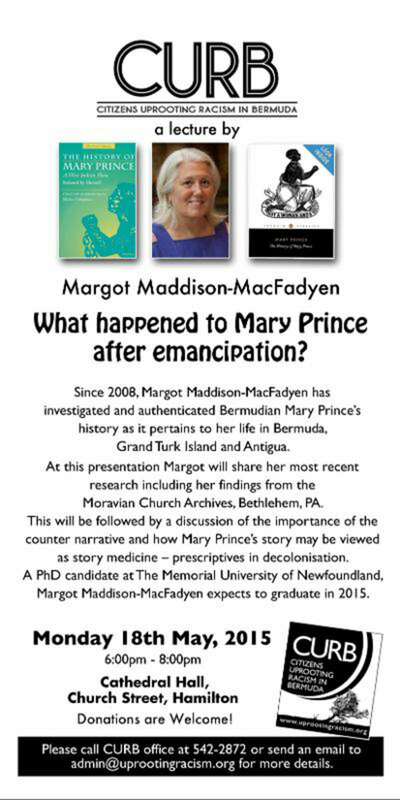 Citizens Uprooting Racism In Bermuda [CURB] will host a lecture by Margot Maddison-Macfadyen “What Happened To Mary Prince After Emancipation” on Monday 18th May, 2015 from 6:00pm – 8:00pm at the Cathedral Hall on Church Street in Hamilton. The event flyer says, “Since 2008, Margot Maddison-MacFadyen has investigated and authenticated Bermudian Mary Prince’s history as it pertains to her life in Bermuda, Grand Turk Island and Antigua. “At this presentation Margot will share her most recent research including her findings from the Moravian Church Archives. Bethlehem. PA.
“This will be followed by a discussion of the importance of the counter narrative and how Mary Prince’s story may be viewed as story medicine — prescriptives in decolonisation.